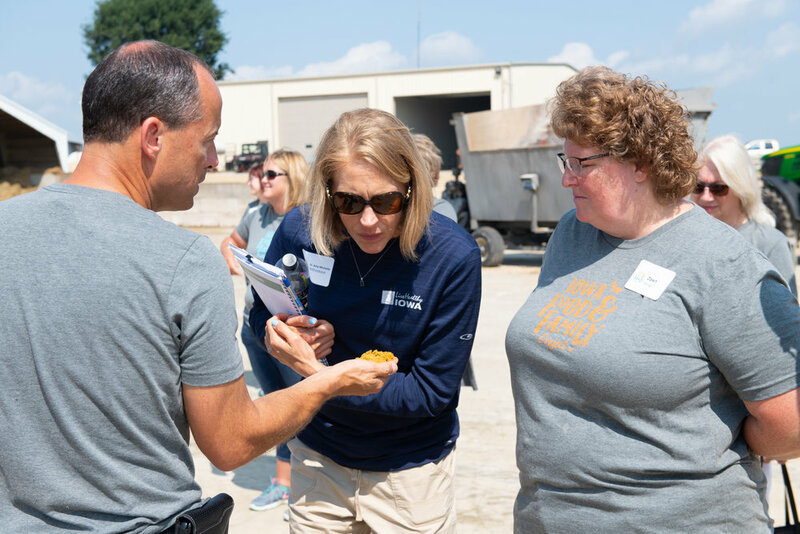 In late August, 50 food-minded consumers hopped aboard a bus through northeast Iowa for the Iowa Food & Family Project’s Expedition Farm Country, which took a deep dive into modern agriculture and allowed participants to interact directly with farm families. 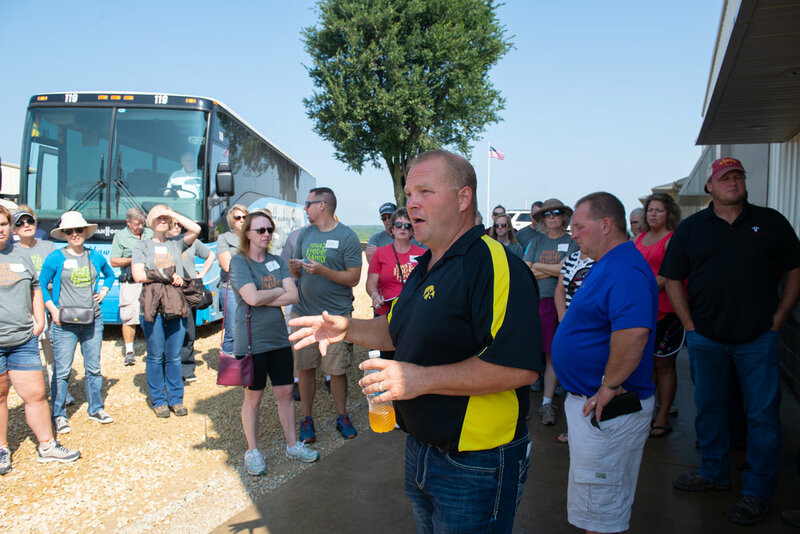 The fourth-annual event included a tour of dairy, soybean, corn, beef cattle and pig farms, as well as Lock & Dam No. 11 in Dubuque. 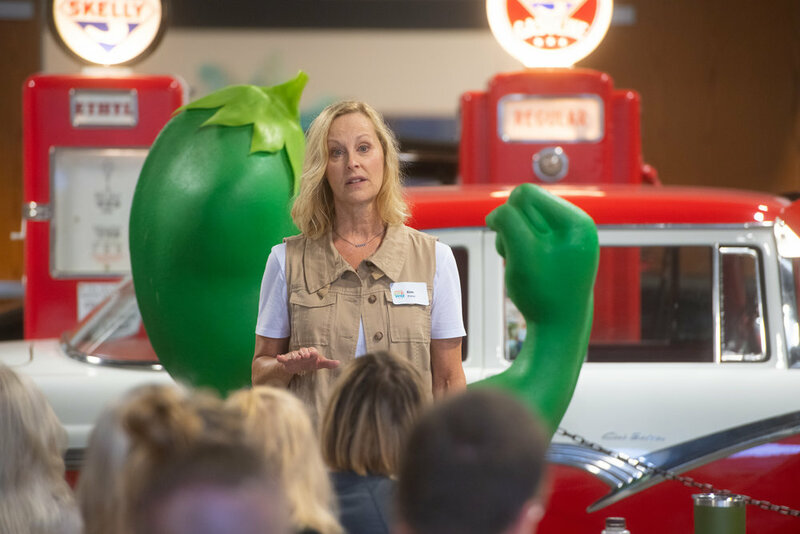 “The Iowa Food & Family Project is about connecting farmers and consumers to build greater understanding and appreciation for farming, and Expedition Farm Country (EFC) truly brings that mission to life,” says Kelly Visser, Communications Program Coordinator at the Iowa Soybean Association and lead organizer of Iowa FFP. 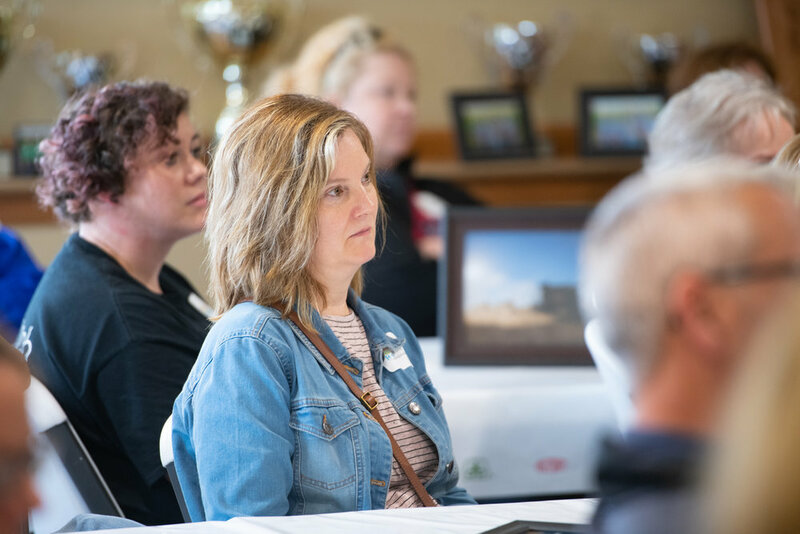 Participants represented a variety of industries and backgrounds including healthcare, food banks, administrative services, communications, education and manufacturing. They were selected in part by their intent to share the expedition experience with personal and professional networks. The tour began bright and early on a Friday morning with breakfast at the Heartland Acres Agribition Center in Independence. The term “agribition” is formed by combining the words agriculture and exhibition. 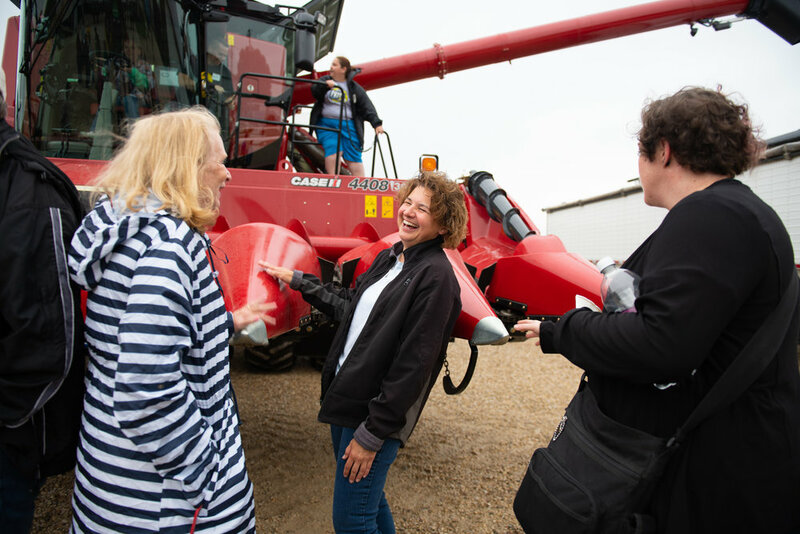 At the Center, visitors were treated to a journey through the history of farming, from the mold board plows of Iowa’s first settlers to modern biotechnology. Country View Dairy in Hawkeye, which is owned and operated by Dave and Carolee Rapson and their five children, provided the backdrop for the first tour. With the slogan, “The way yogurt should taste!” participants were taken on a journey from production to finished products. The business started in 2002 when Dave and Carolee moved to Hawkeye to pursue a dream of starting a dairy farm. For Carolee, it was the preservation of a family legacy. For Dave, it was the evolution of a love for dairy farming discovered at the age of 17. Dave’s experience working on neighboring dairy farms combined with Carolee’s background and knowledge of the profession led them to purchase their dairy farm and begin a homesteading life together. In 2011, with five children ages 4 to 17, the Rapsons knew they must evaluate the future of Country View Dairy. Because of the extreme challenges facing many dairy farmers, it became clear the family needed to create something special to ensure Country View Dairy would be a lasting enterprise. For years, Carolee had been making homemade yogurt for the family on a small scale. 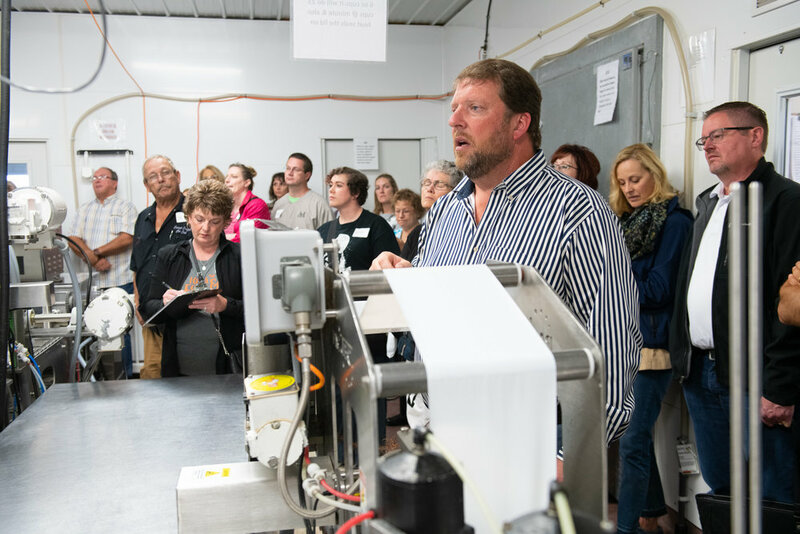 After discovering there weren’t any other yogurt producers in northeast Iowa and there was a demand in their community for local, healthy, all-natural, cultured foods, the Rapsons decided to pursue the art of making yogurt on a larger scale. In 2011, they built a brand new, state-certified creamery on the farm. The creamery pumps farm fresh milk less than 200 feet from the milk house to make their signature product — all natural, creamy and delicious farmstead yogurt. There are 200 milking cows on the farm, and 80 percent of the milk goes to Waspie Valley for cheese. Country View Dairy uses 20 percent of the milk produced for their Iowa State Fair award-winning yogurt. “We started out making 500 pounds a week, then grew to 1,000 pounds. Now we make 21,000 pounds a week and generally operate four days a week. Every week, a half-day is devoted to cleaning all the equipment,” Dave Rapson says. Country View Dairy’s original and Greek yogurt varieties are made from low fat (1 percent), Grade A pasteurized milk from their own healthy and well-loved cows. The milk is non-homogenized, allowing the cream to rise to the top the old-fashioned way, with the added benefit of making it easier to digest. In addition, Country View’s yogurt is free of preservatives and artificial thickeners. The yogurt is sold in over 120 stores in seven states, numerous public schools, colleges, hospitals and restaurants in the Upper Midwest. As a certified Grade A dairy, Country View meets the highest standards of temperature control and inspections for quality of the milk and cleanliness. When making yogurt, the heating process is important in uniformly spreading out the protein. It’s crucial to maintain the right temperature, which is a little over 100 degrees. In 2013, Country View Dairy began making Premium Frozen Yogurt Soft Serve Mix. 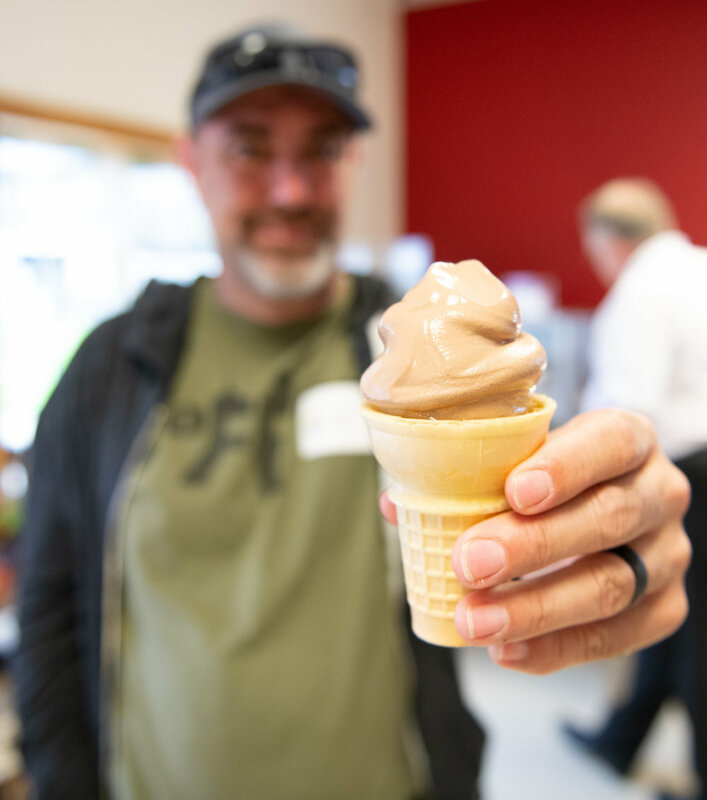 Their line of soft-serve frozen yogurt is available in several restaurants, colleges and schools. Fun Facts: Country View is the only creamery in Iowa making Greek yogurt, and one pound of milk makes one pound of yogurt. Their No. 1 selling product is Lemon Custard Greek Yogurt. Packed with protein and carbohydrates, dairy is a nutrient-rich powerhouse that fuels the body and nourishes the mind. In Farmersburg, Joe and Suzanne Shirbroun along with their three sons — Tom, Andrey and Nate — raise soybeans and corn for feed and fuel on the 1,400-acre farm. In addition to their crop operation, the Shirbrouns are Pioneer seed dealers. Suzanne is the sixth generation of her family to live and work on the family farm, which was purchased in 1873 by her great, great, great grandfather Matt. The family is focused on using technology and sustainable agriculture, and they believe making sound agronomic and economic decisions is what sustains a farm. They use no-tillage and conservation tillage practices. No-tillage is just like it sounds — no disturbance of the land. This leaves the plant residue of the previous year’s crop on the soil surface. Leaving extra plant residue on the soil surface helps protect the soil from washing or blowing away all year long. In this part of Iowa, no-till practices are used by many farmers to combat soil loss on the rolling hills and slopes of the land. Terraces and waterways are other conservation practices many northeast Iowa farmers use to preserve their land. A terrace is a structure made of soil and looks like an inverted V. The terraces are laid out across the slopes to systematically slow the movement of water. The Shirbrouns have over 43 miles of terraces on their farms. In the fall, after their crops are harvested, the family spends weeks adding new terraces or repairing older terraces and tiling. “Over the years, our farm has transitioned from having barns and silos for livestock to more buildings for equipment. While we now focus solely on crops, one thing that hasn’t changed is the land. The land is here forever, and we must take care of it. We’re passionate about conservation,” Suzanne Shirbroun says. 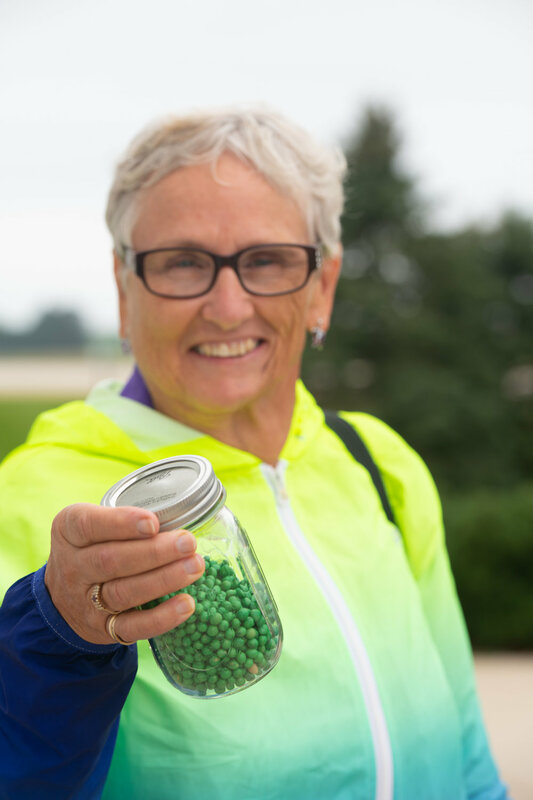 Beyond the farm, Suzanne serves on the Iowa Soybean Association board of directors, and she and Joe are active in community outreach and consumer engagement. Katie Hyde, an EFC participant from Indianola, echoes those sentiments. "Farmers are treating their land and animals with the utmost respect. This is their livelihood, and they want to conserve and preserve the land for future generations." Fun Facts: Cover crops – such as cereal rye, oats and radishes – are widely used by the Shirbrouns. They use aerial seeding of the cover crops, which roughly costs $33 per acre. Cover crops are a valuable tool in helping to conserve and improve the soil. Soil tests are regularly taken throughout their fields to help the Shirbrouns know exactly what nutrients – if any – are needed for the health of the soil. 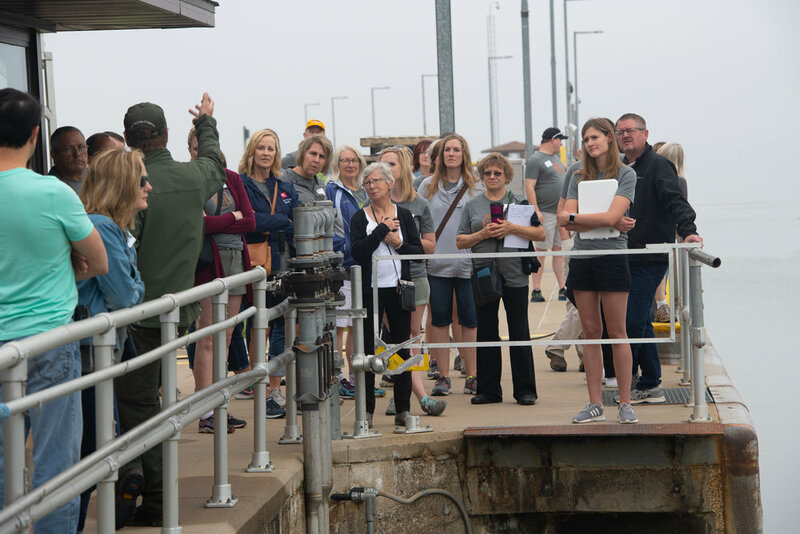 On Saturday morning, after a relaxing overnight stay and hearty breakfast at the Hotel Julien in Dubuque, participants greeted the morning with a tour of Lock and Dam No. 11 located between Dubuque, and rural Grant County, Wisconsin, on the Upper Mississippi River. It was opened to navigation in 1937 and is one of 29 locks and dams on this portion of the river. The Mississippi River is truly a working river. Approximately 60 percent of exported grain, such as corn and soybeans, in the U.S. moves on the Mississippi River. Barges heading up and down must go through the locks and dams of the nation. 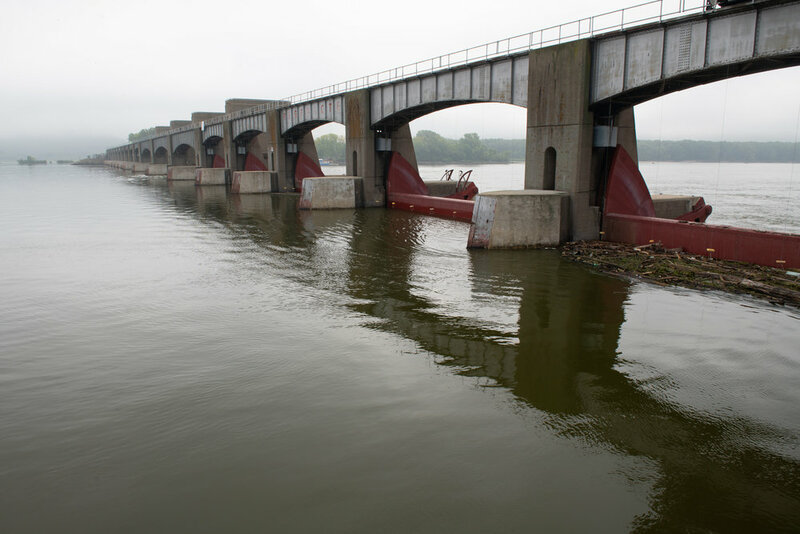 The movable portion of the dam is 1,478 feet long and consists of 13 tainter gates (a radial arm floodgate used in dams and canal locks to control water flow) and three roller gates. The non-movable part is a 3,340-feet long non-overflow earthen dam that connects to the Wisconsin shore. The main lock is 110 feet wide by 600 feet long. There is also an incomplete auxiliary lock. The lock and dam are listed on the National Register of Historic Places. Locks and dams create a series of steps which river tows and other boats either climb or descend as they travel upstream or downstream. 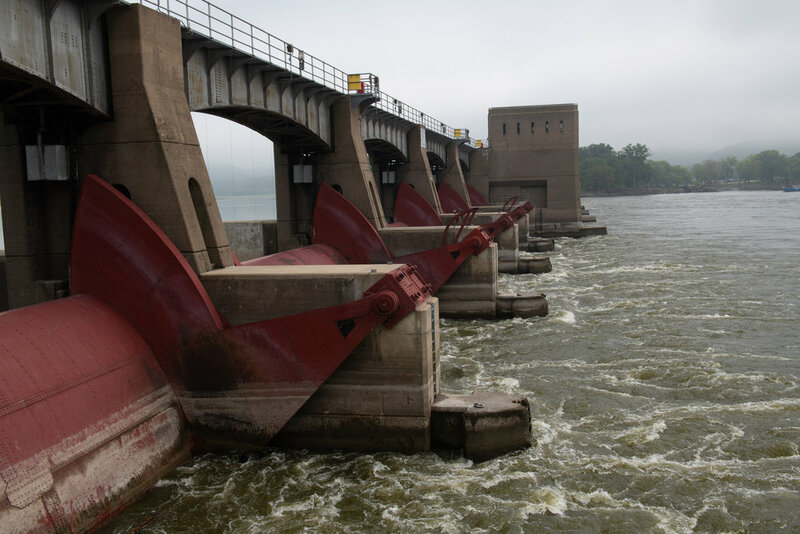 Locks and dams on the Mississippi were not built for flood control or to eliminate all the low spots caused by shoaling on the river bed (buildup of sediment causing a hazard to navigation). Fun Facts: On an average day, four or five barges will come through Lock and Dam No. 11. One 15-barge tow, which is 0.25 mile in length takes 1.5 hours to get through and is the equivalent of 1,000 semi-loads! Fourth generation farmers, Marty and Steve Schwers, raise cattle on their family farm New Vienna. The brothers have been farming together in Dubuque County since 1989. Marty and Steve’s father previously farmed on the same site. After transitioning out of the dairy business in 2000, Marty and Steve began to build feedlot facilities on their farm that are now home to about 2,700 head of black angus cattle. In 2014, they added a 1,080-head cattle barn to their operations. The design of the barn always allows the cattle outdoor access and protection against inclement weather. Additionally, the Schwers brothers installed rubber mats on the slats and an irrigation system for increased animal comfort. The new slatted, monoslope cattle barn is an example of how modern livestock buildings enhance animal care and provide environmental safeguards. The Schwers contain everything from the cows, so no contaminants enter waterways. The cattle are fed one time a day. 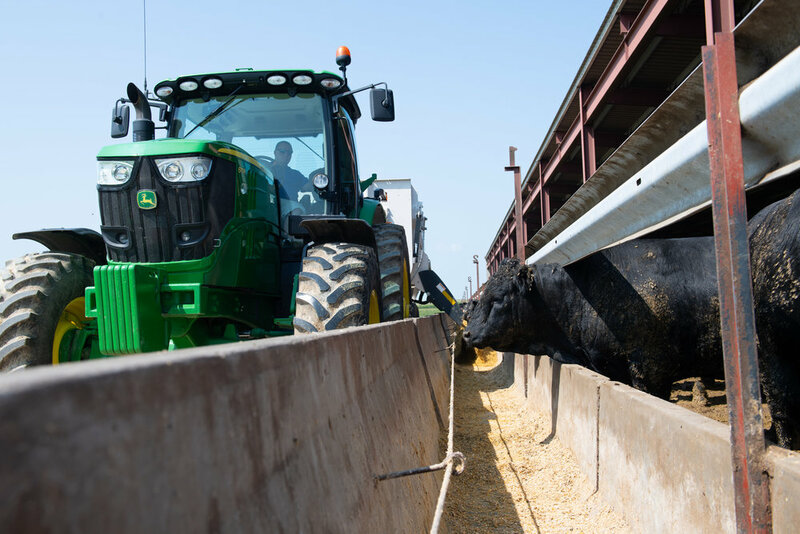 Using technology, the Schwers mix custom rations of hay, corn silage, distiller grain and liquid protein depending on the cattle’s maturity level. Throughout the year, the brothers work closely with a nutritionist and a veterinarian to ensure animal health across the lifespan, as well as feed efficiency and meat quality. In addition, their veterinarian takes care of all the paperwork for the livestock, which requires documentation for every vaccination or treatment a cow may receive. Once the cattle reach market weight, nearly 90 percent are taken for processing at Iowa Premium Beef in Tama. 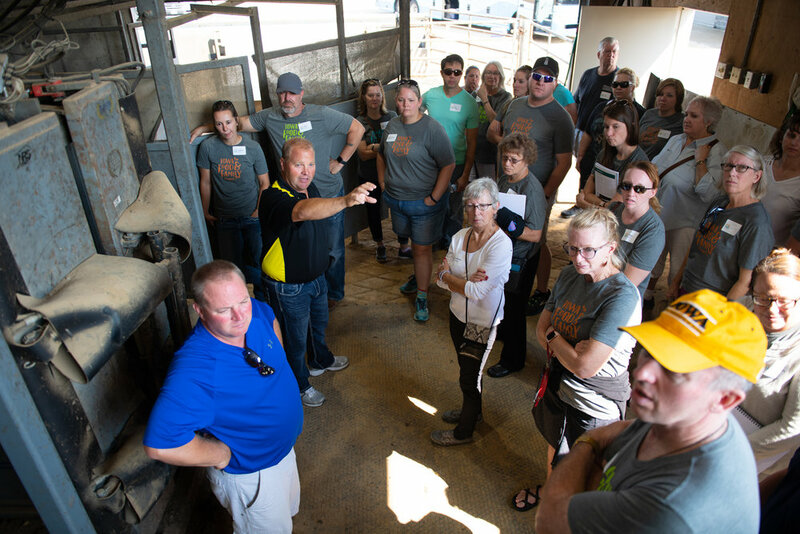 “Animals raised for human nutrition are well treated very well, and the treatment is constantly improving as farmers find ways to incorporate new technologies,” says Earl MacLeod, an EFC participant from Ankeny. Fun Facts: A cow that weighs 800 pounds is typically one year old, and each cow eats 35 to 40 pounds of feed every single day! At the Schwers Farm, they make 12 batches of feed every morning. From start to finish, it takes about 2 hours and 15 minutes to feed the cattle. All corn grown on the farm is for feed. In fact, 80 percent of their cows’ dietary needs are met with what they grow right on their farm! Iowa is one of nine states where the cattle outnumber people. 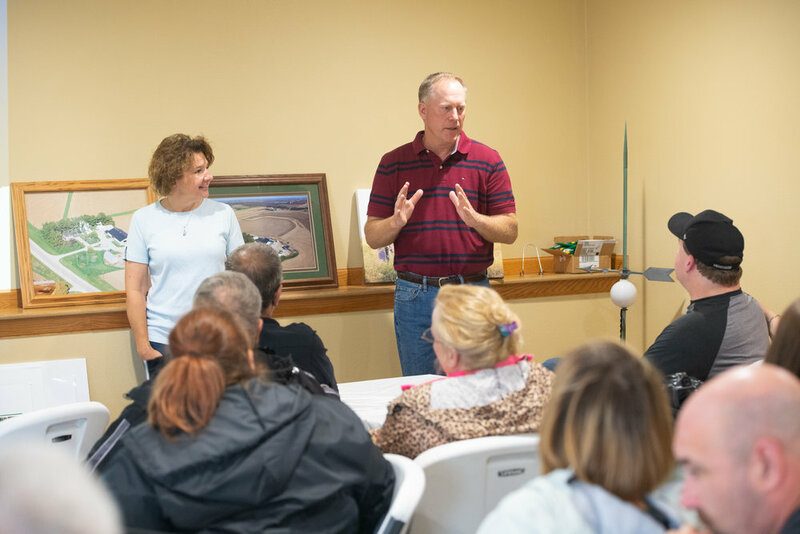 The final leg of the tour included a stop at G&W Pork in Aurora where Al and Kathy Wulfekuhle shared insights on pork production, biosecurity and animal welfare. Their commitment to helping young people get into farming runs deep. The operation has 12 employees and three farms totaling 1,800 sows. Al developed a passion for pigs at an early age. He spent a lot of time helping his dad on their 90-sow, farrow-to-finish hog farm, but it was a summer spent working for a large farmer in the area who had multiple employees and newer equipment and facilities that piqued his interest. Al and Kathy started farming and raising pigs in 1979. Curt Gentz was the Wulfekuhle’s first full-time employee, and they started G&W Pork to allow him and his wife, Cindy, to obtain ownership in their hog farm and get a start in farming. The business follows the same model today, with all employees receiving shares yearly as part of their compensation package. G&W Pork works almost like a cooperative, but employees and growers get to keep their independence. 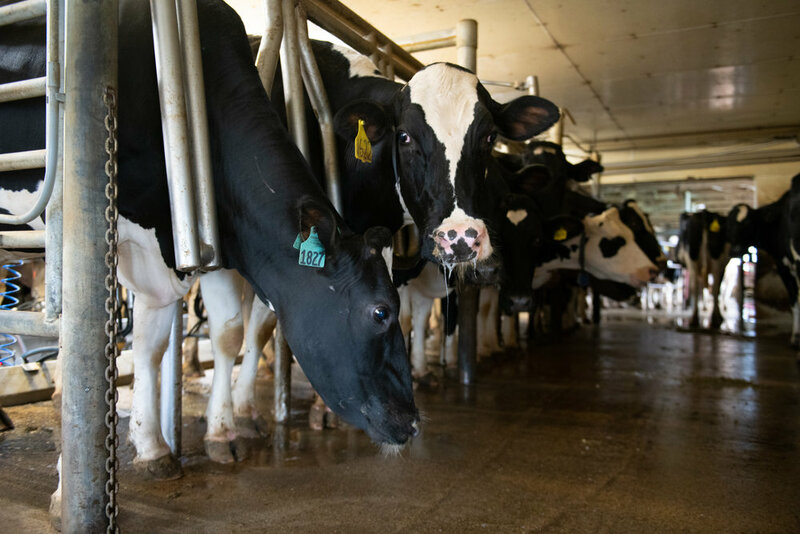 Growers can build different sizes and types of wean-to-finish barns to fit their financing and land base, as long as they have the same humidistats and power inlets for uniform ventilation and the same feeder types. Comfort is a priority for the Wulfekuhles, and it’s evident by the sprinklers, fans and ventilation through the barns. Al is a past president of the Iowa Pork Producers Association and has participated in several trade missions to China. He spoke of the impact tariffs have on their operation. “One of the biggest surprises was the losses at G&W Pork due to the tariffs and how they didn't really have much choice but to keep selling at a loss in the short term,” says Shane Church, an EFC participant from Pleasant Hill. Fun Facts: It takes about 6 months for a pig to go from birth to market. Iowa is the No. 1 pork-producing state in the nation, accounting for 141,000 jobs in the Hawkeye State. Farmers today provide one pound of lean pork using 41 percent less water than they did nearly 60 years ago. 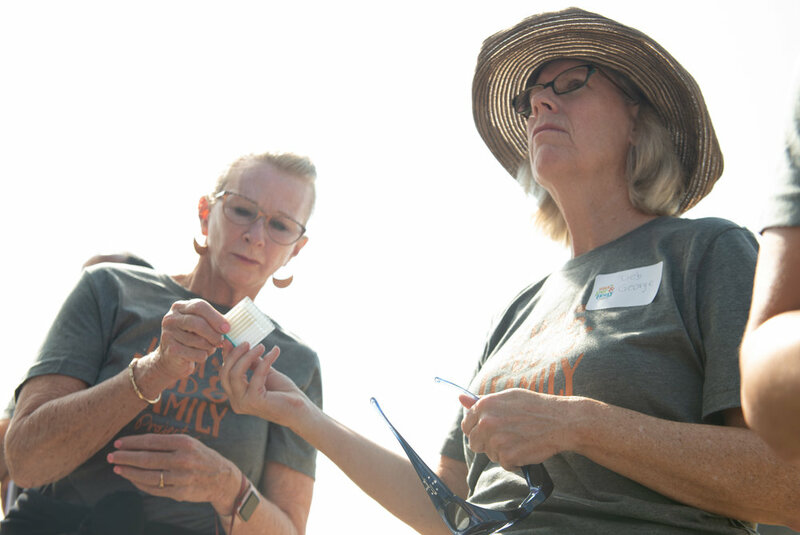 Following the two-day tour, participants completed a brief survey, and 100 percent noted they would recommend participating in Expedition Farm Country to family and friends. In addition, everyone said their knowledge of modern agriculture increased because of the tour. Editor’s Note: Expedition Farm Country is held annually. The 2019 dates and invitation to attend will be announced next spring through Fresh Pickings and on our website.